It is winter in the NW, and while most think of Hot Toddies or Hot Buttered Rum drinks to warm them up, Andrew and I are mixing up something new to us…. Athol Brose. Sounds mysterious and old doesn’t it! This drink dates back the 15th Century in Scotland A cocktail to warm the soul on a winter’s day, though it is served very chilled and not warm, it does warm the body nicely. The sweetness of the honey compliments the bold spiciness flavor of the whiskey just perfectly. The cream and nutmeg on top are like the cherry on a sundae. First you need to make honey syrup. Very similar to simple syrup, but with honey. Bring to a boil, equal parts of honey and water, then let cool before using. Make a large batch and refrigerate to have on hand for when unexpected guests arrive. Now for the Whiskey. There are soooo many types out there. 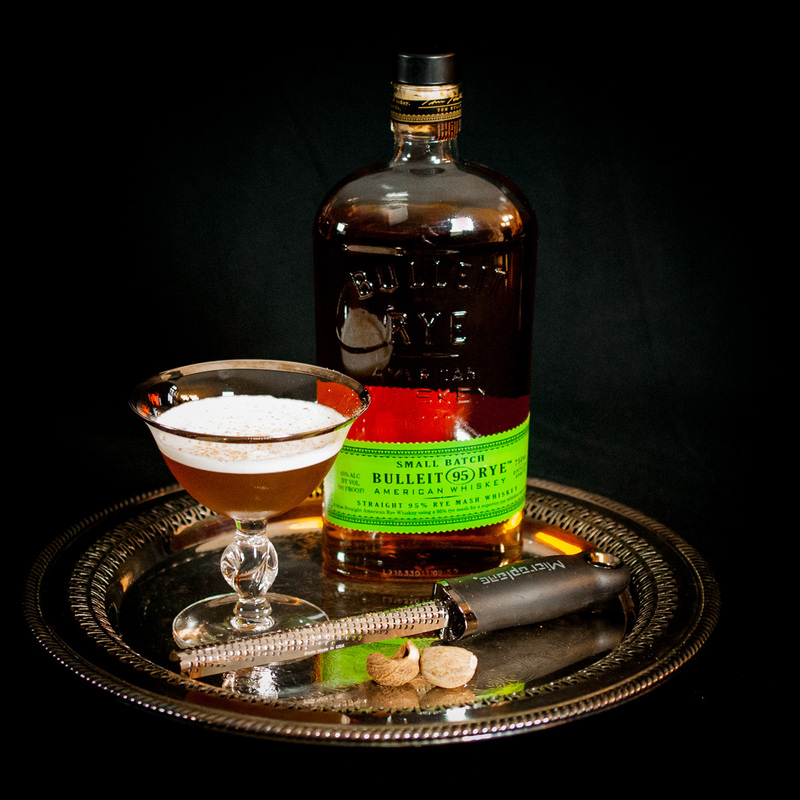 We really like this one, Bulleit Rye. It’s affordable and very smooth. It mixes well for Old Fashioned’s and many other cocktails calling for a Whiskey. I also use it in baking too. Also you will need a few bar tools. If you love to make cocktails, you should have these in your bar at all times…. A mixing glass with shaker, tall mixing spoon, strainer, shot glass, and a micro plane for spices. Have your mixing glass and shaker chilled. Over ice, mix the honey syrup and whiskey with a tall spoon. Do not shake. Shake cream in chilled shaker and glass for about 30 seconds. Carefully spoon on top of whiskey. Grate a little nutmeg on top.